Hi everyone. 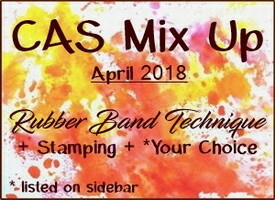 Today is the reminder for the CAS Mix Up April Challenge - Rubber Band Technique, hosted by Julia. The card above only took a few minutes to make, so I ended up making three to build my Christmas card stash. I used pieces of acetate with alcohol inks that I had in my stash, added a backing of computer paper. Used a brayer, covered with elastic bands, loading it with Versamark ink and running it lightly over top of my acetate. 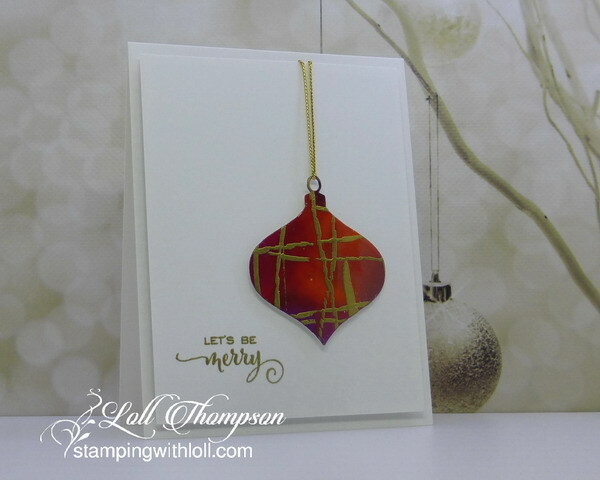 Then sprinkled on embossing powder (gold for the card above), and heat to melt the powder. 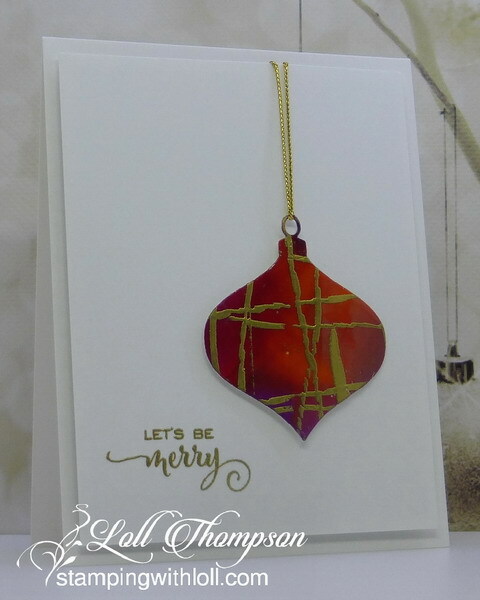 Die-cut my ornament and popped it up on my card front with a heat embossed sentiment and some gold cording. This is such a fun and easy technique. I hope you'll give it a try. Please check out the challenge blog to see the reminder post with new cards from our Designers and wonderful Guest Designer, Hideko. Then come play along. 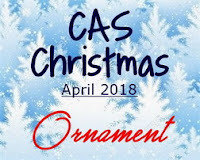 I'm adding this to the CAS Christmas April Challenge - Ornament. Oh wow, Loll, those are gorgeous. Such lovely CAS cards. You have an incredible talent for combining simplicity with so much class. Love the rich colors, particularly on the green one. 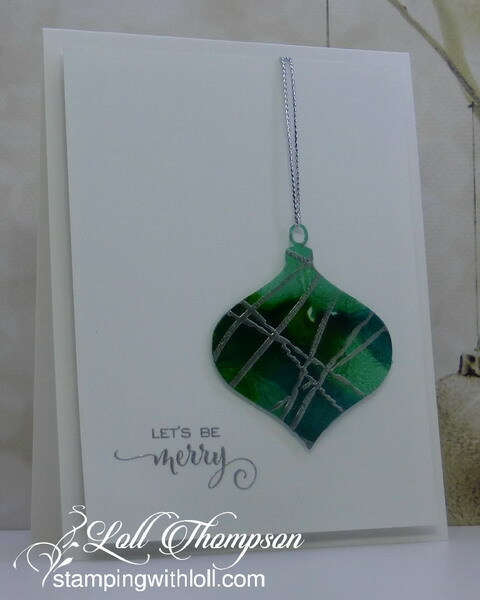 The good embossing with rubber bands are fantastic on these gorgeous ornaments. And better yet - three more for the Christmas stash, something I'm falling behind on. Such beautiful ornaments, Loll! I love all the colors equally! I love how all the white space lets the ornaments shine! CAS perfection here Loll. Love the different colours. Fabulous! CAS and stunning Loll, and I love the way you have used the rubber band technique. Fabulous cards and a beautiful effect with the rubber bands. So very pretty, Loll! How fun that you were able to get three beautiful and also unique looking cards done so quickly. Wow!! GORGEOUS, love the technique and the results you have. Way to combine the two challenges, Loll. I'm sitting here right now trying to decide how to do my ornament. Yours are beautiful with the rubber band gold embossing. wow Loll, what incredible colours for your ornaments. the shading really gives them dimension and love the gold splashes from your rubber band embossing. All the colour variations are fabulous, Loll, but the first is my favourite - love the rich contrast of the red and gold! What a great way to use the rubber band technique! Well I thought your gilded stars were a brilliant idea Loll but these ornaments are fantastic... simple effective use of the rubber bands embossed in gold and wella you've got gorgeous baubles.